Berkeley City Auditor: Jenny Wong. 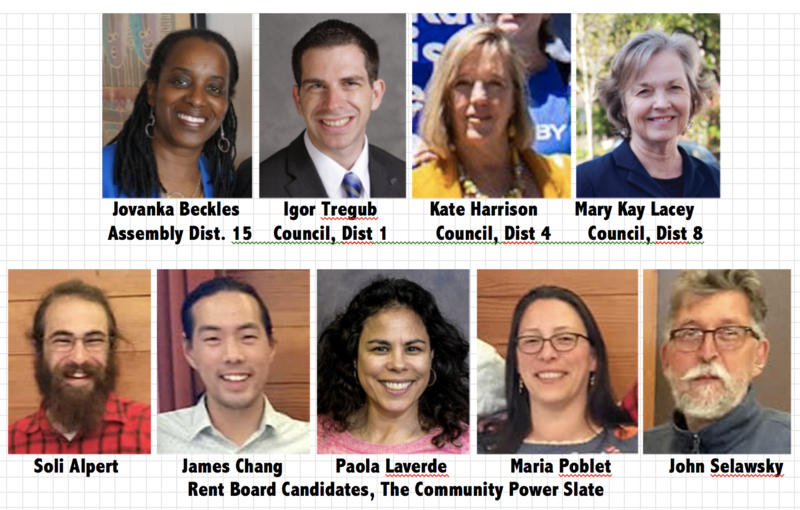 Join our Berkeley Citizens Action, Berkeley Progressive Alliance and Berkeley Tenants Union for a joint endorsement meeting on Berkeley ballot measures & District 7 council endorsements. Council candidates include Aidan Hill, Rigel Robinson & Ces Rosales. Speakers also include Gus Newport, Gail McLaughlin, plus George Lippman will present on his vision for police accountability moving forward. Kriss Worthington will provide closing remarks. We will also consider endorsement for the city auditor position. In March the vote of progressives was evenly split between candidates Jenny Wong and Steve Levine, so no endorsement could be made. Steve Levine has since dropped out and endorsed Jenny Wong, so we are reconsidering this office. Vladislav Davidzon is also running, however responded that he does not want any endorsements. Additionally, BTU members will vote on finalized candidate endorsements for Districts 1, 4, & 8 (their steering committee had previously made interim recommendations). If your membership for any of the three organizations has expired, don’t worry… You can pay the current years dues at the door. You can even join BTU without the usual 30 day wait by participating in our canvass earlier that day (see link here). Help us choose our slate of progressive candidates for 2018. Candidates who have submitted their questionnaires and will be on the ballot are listed below. Click on their link to read their questionnaire. This event is open to all. Members of BCA or BPA will be able to vote for endorsements. Past members may pay current dues (by check or cash) in advance or at the door. Please renew membership in advance to avoid lines during registration. No one turned away for lack of funds. BCA: Membership is $35 yearly, $10 low income. To renew membership online: http://berkeleycitizensaction.org/?page_id=2. When: Sunday, April 29, 2 to 5:30 p.m., Registration begins at 1:30 p.m. Candidates who return our questionnaires by April 19 will be listed on our endorsement ballots. Questionnaires will be posted on the BCA and BPA Web sites shortly after April 19.
Who can vote: You must be a member in good standing of either BCA or BPA to receive a ballot and vote at the April 29th meeting. If you have ever been a member of BPA, you may renew your membership before or at the April 29th meeting and will be able to vote. Annual dues are $25; $10 for low income and students. You can renew your membership online: https://berkeleyprogressivealliance.org/joinrenew/. We encourage members to renew before the meeting if possible to speed up the registration process on April 29th.